Love making costumes but can’t find the right pattern? It’s easy to alter a pattern to create any costume you can imagine. Last year our family dressed up as characters from the movie Mary Poppins. As we planned and prepared our costumes, we ran into a couple of problems. 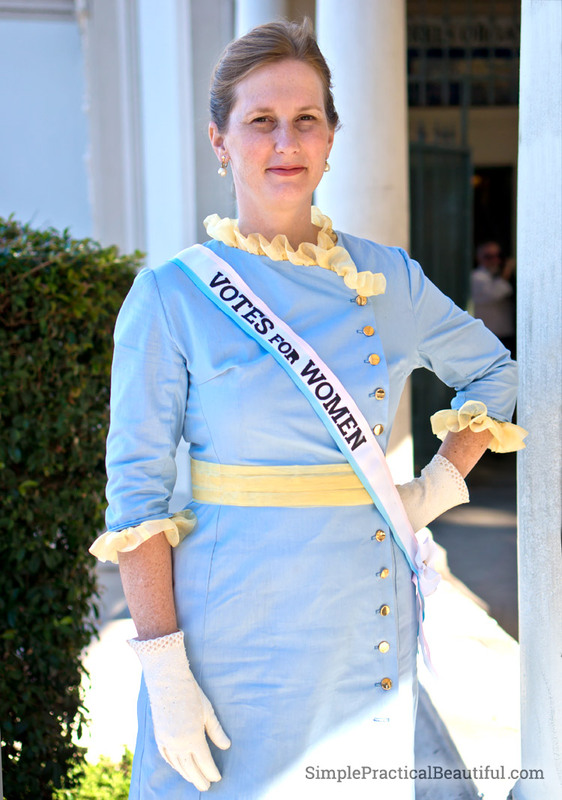 No one sells a Mrs. Banks costume, or even a pattern to make her dress. And even though the character of Mary Poppins in much more well know, no one sells a tween-sized version of her costume. (Mom’s of tweens in that awkward not-in-girls-clothes-but-not-in-womens-clothes, I know you feel my pain). We had to make our own costumes by altering a couple of patterns. We found patterns that were similar to the outfits we wanted, and then altered those patterns to look like the characters. 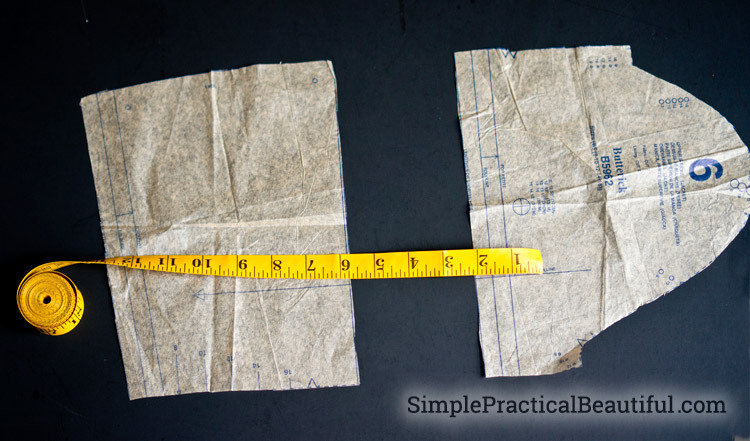 If you know how to sew from a pattern, then altering a pattern is pretty easy. I was lucky to find a picture online of the actual costume Glynis Johns wore as Mrs. Banks. I studied it carefully to see what the dress needed. The dress is essentially a long, form-fitting jacket. It has no collar. It buttons up the side instead of the front, which means the right side of the dress is wider than the left side. The sleeves are 3/4 length. Oh yes, and buttons, lots and lots of buttons. The sleeve length is easy to change. Making a jacket longer isn’t too hard either. 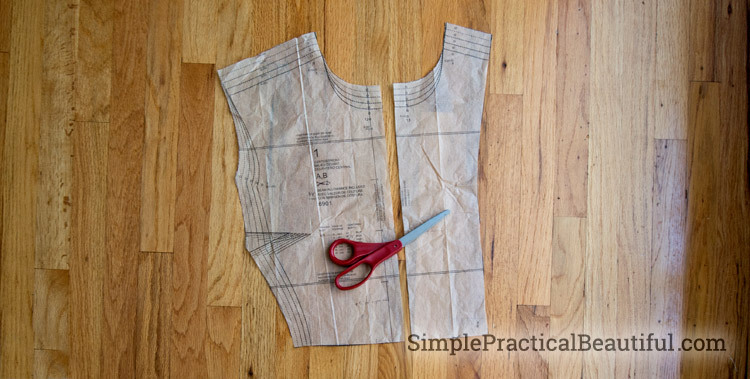 Changing the pattern to button up on the side, instead of down the middle would be a little trickier, but not impossible. So, I needed to find a pattern for a form-fitting jacket with no collar. 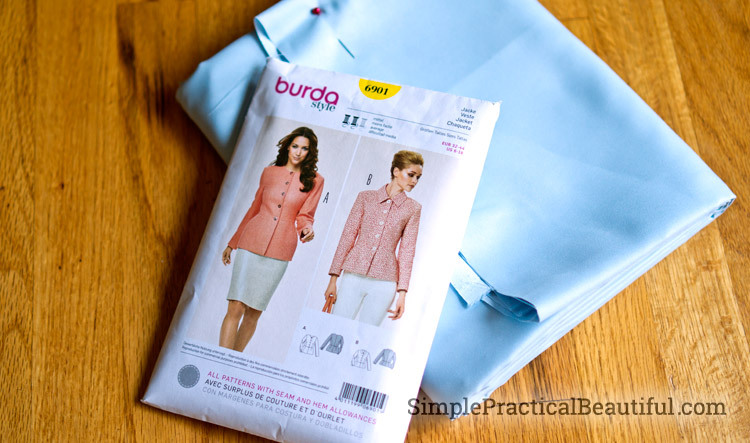 I found Burda #6901 that looked pretty good. 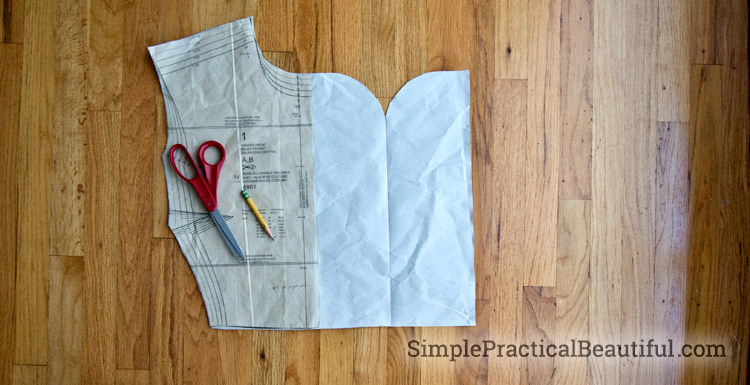 It even had the bottom of jacket as a separate piece of fabric, or peplum, which would make lengthening it easier. It had all the essentials for Mrs. Banks’ dress. Most of the pattern, I used as directed. That’s why it’s so important to start with a pattern that has the basics right. I made new pattern pieces for the parts I needed to change. Mostly I traced the original pattern pieces and added a little to it. I started with the hardest part first, widening the jacket. It’s more difficult because you have to change the facing part too (the inside piece of the jacket). The particular pattern was made so that the edge of the front piece is folded over to make the facing. I had to cut the facing part off of the front part. 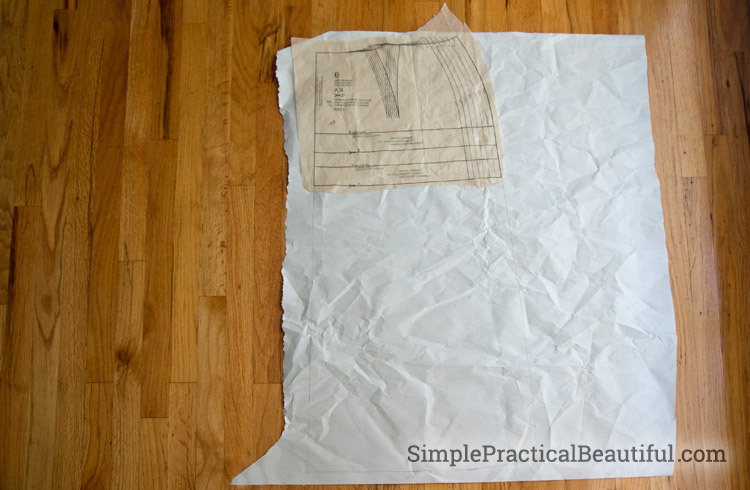 I taped the pattern piece onto a large paper and drew a line 5 inches from the side (I wanted the new side to be 5 inches from the middle of the jacket). Then I added the same amount again for the new facing. I also made the top curve downward because the right side of Mrs. Banks’ dress is curved at the top. Finally, I added the pattern part I had cut off before to finish the facing. Yes, the dress is probably going to have more facing material than it needs, but that’s okay. 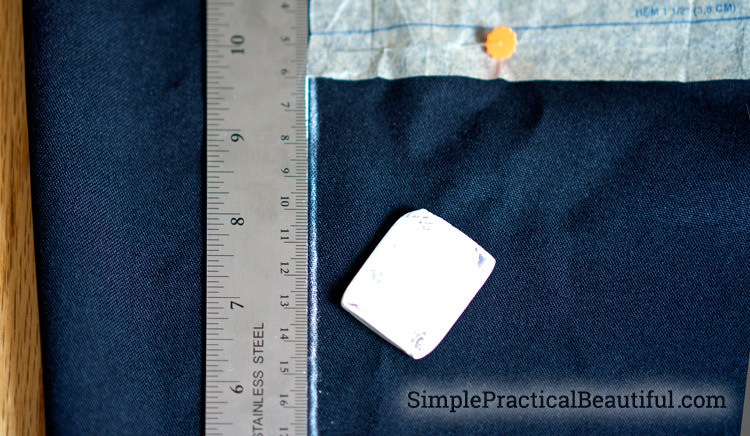 When the final piece of fabric is folded over at the curve, it will look perfect. Next, lengthening the jacket to be a dress. The final dress needed to be almost ankle-length, about 22 inches from my waist. I took the back peplum piece, taped it onto large paper, and made it 22 inches long, plus a couple extra inches for the hem (better too much than too little, extra can be cut off later). 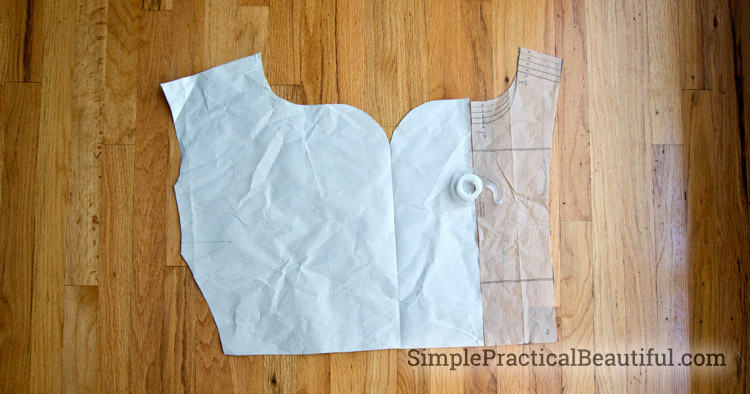 I did the same for the front peplum, except I needed to widen the front right side, just like the top of the jacket. Instead of worrying about cutting off the facing this time, I just added 10 inches to the right side (5 to widen the dress, 5 to widen the facing). 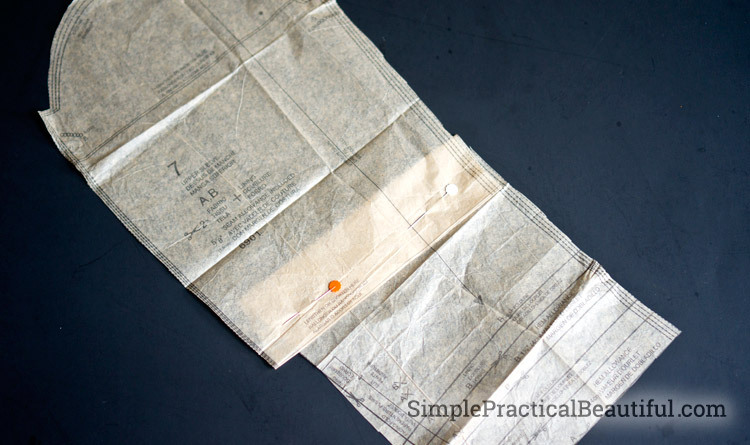 No need to draw a new pattern piece for this part. 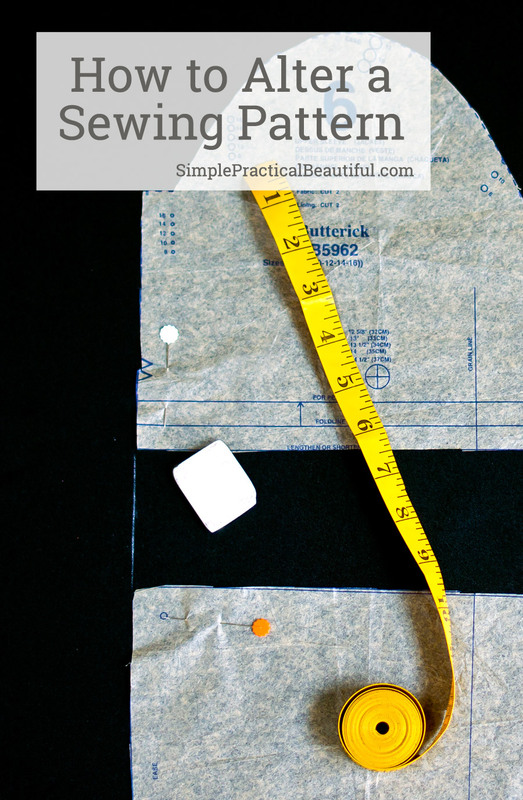 Most patterns have a line that says “Lengthen or Shorten Here.” This is so you can make clothes that fit you perfectly. I used that same line to really shorten the sleeves. I took 6 inches off just by folding the pattern piece up at that line and pinning it. Unfortunately, I have no pictures of cutting out the fabric. It was getting close to Halloween, and I was in a hurry to finish. Mostly, this is a pretty straight forward step anyway. I bought a couple extra yards of fabric to account for the longer pattern pieces. I laid all of the pattern pieces out on the fabric except two, the front jacket and the front peplum (lower jacket, now skirt). For those two pattern pieces, each side had to be cut separately because I wanted the right side of the jacket wider but not the left side. I cut a single thickness of the fabric with the two new pattern pieces I made. Then I taped the front jacket piece back to it’s original shape and cut that out of fabric, upside-down so that it would be opposite of the other side. Last, I cut the extra 10 inches off the side of my front peplum and cut that out upside-down. I followed the pattern directions and sewed the whole thing together just like it said. With my altered pattern pieces, it turned out alter just the way I wanted it. I used Simplicity to make a Marry Poppins jacket for my 10-year-old daughter. It had the right collar and the right princess seaming to make the form-fitted bodice and full skirt. The alterations we needed to make were lengthening the sleeves, lengthening the jacket, and making it smaller around to fit a tween. 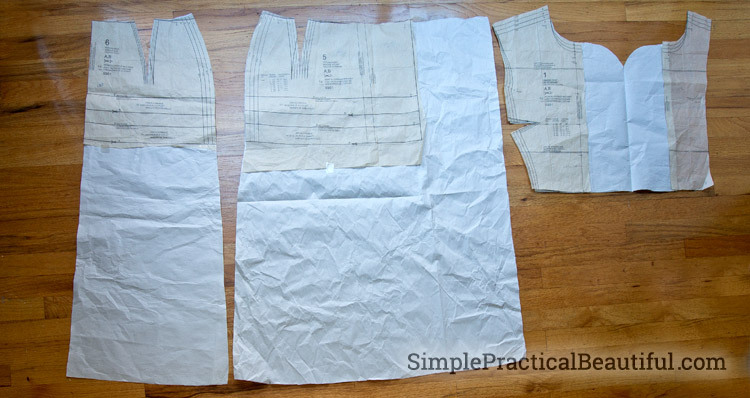 All three alterations are very easy to make to any pattern. 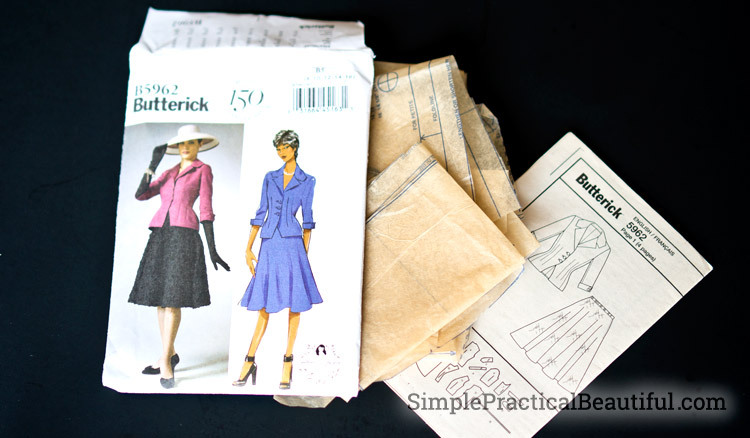 The sleeves we altered just like my Mrs. Banks dress, by using the “Lengthen or Shorten Here” line. Instead of folding it, we cut it and stretched it longer. Four inches longer. To lengthen the jacket, I didn’t make new pattern pieces this time. I pinned the pattern pieces onto the fabric and used chalk to draw on the fabric. We added about 15 inches. Making the jacket smaller turned out to be really easy. The sleeves fit well enough, so I just needed it smaller around the chest and waist. This alteration I did after the jacket was sewn together. I had my daughter try on the jacket inside out. Then I pulled the side seams until the jacket fit, and pinned the seams. My daughter hated wearing the jacket with pins, even for just a few seconds, but it’s the best way to get a perfect fit. I sewed up the side seams along where the pins were, and the jacket fit her perfectly. And here’s my cut Mary Poppins: practically perfect in every way. 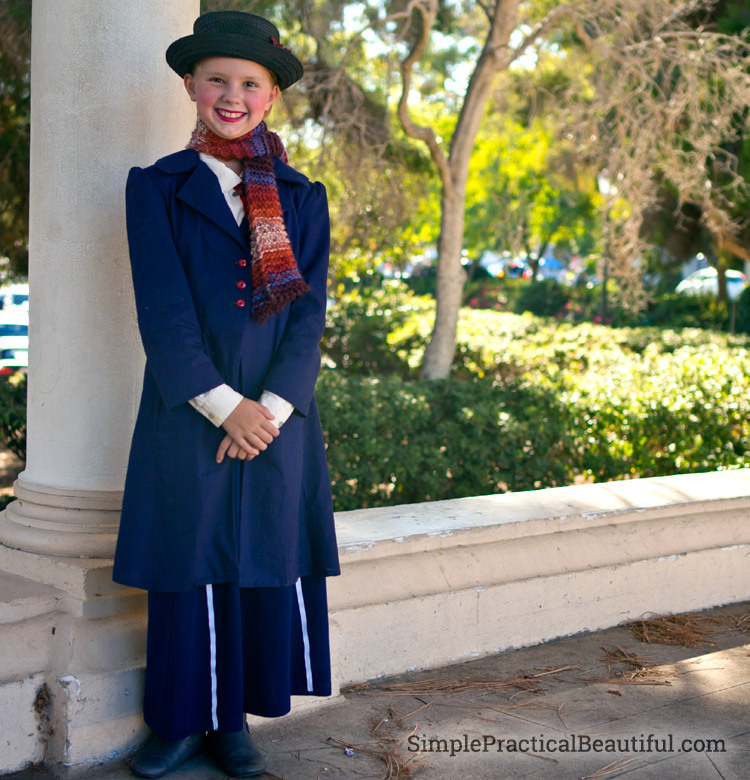 Take a look at the rest of our Mary Poppins family costume and read how we made all of them. Plus get details about the other parts of these costumes. I cannot for the life of me sew something so complicated but your tutorial makes sense even to a non-sewer like me. I love your cute outfit and your daughter’s costume as well. You guys have wrapped up the Halloween thing. I hope you all go trick or treating to show off those cute costumes. I’m glad it makes sense. I’ve been altering patterns for so long that it’s second nature to me, so I was really worried about writing this post and making it easy to understand. Thanks. And we go to as many Halloween parties and activities as we possibly can so we can wear our costumes! Thank you so much for these instructions. My 19 yr old granddaughter wants me to make this costume for a Halloween party this year. Thank Goodness it is only Aug 1st. I have been searching for a pattern for weeks and ran across your site by shear luck. I will try to find the Burda pattern. I am 82 yrs old and haven’t sewn much since my 5 kids were young. Needless to say, this will be a challenge. I am able to understand your instructions very well, but have a question. How much facing is to be allowed on the right side of the skirt? Your diagram doesn’t appear to show any. Also, You didn’t mention the petticoat. Did you make a crinoline-type full skirt to wear under the jacket? Wasn’t that too bulky? Thank you so much for your help. If this turns out OK (she is soooo picky), she will want to wear it again. This will be my third one for her. I’m so glad this post is helpful! I added 5 inches to the right side of the skirt and 5 more inches to its facing (for a total of 10 extra inches). This made the facing on the right side 7 inches wide, if I remember correctly. That’s a really wide facing, but the skirt opened some when I walked, so I was glad to have plenty of nice-looking facing showing from the inside. The petticoat is just a gathered skirt of chiffon. There’s nothing under the top. I gathered small strips and sewed them along the edges of the jacket sleeves and the neckline to make it look like there was. Good luck! I’m sure your granddaughter will be so happy with her costume. She’s lucky to have have a grandmother like you. Let me know if you have any other questions, or if my answer wasn’t clear enough.